Apple is doing so much better than our government. Imagine that. Maybe Steve should be our President. I would love it. Just about anybody would be better than the one that we have now. What if we wrapped all that "change"? Would that help? I was just about to say...a homeless person with some change in a cup has more money than a country that is bafflingly in debt. Well, it's all Bush's fault, and also the Republicans. Everyone knows that. It's a fact that Bush has been in office spending all that money for the past three years along with the Republican controlled House and Senate for the past three years. I don't blame democrats, I don't blame republicans. I blame politicians. And honestly I don't blame Obama for this, this train wreck has been years in the making and he's the one unfortunate enough to be President when the trail derails. You would be partly correct if Obama hadn't voted in favor of the spending bills passed by Bush. If you want to balance the budget, stop sending money overseas to feed the world. Half of those people don't give a damn about us anyway. The U.S. should follow the lead of Australia. Speak our language, follow our laws, or go back where you came from. BrindawithanI, ctt1wbw and Fausty82 like this. Post of the ****ing year right there. Spot on, my friend. Many of the nations receiving this "humanitarian aid" either directly or indirectly support the terrorist who are bent on destroying us and our way of life. On a related note, most of the users on TiPb have more money at this point that the US Federal Government. Is anyone here even $1 million in debt? Nevermind billons or trillions. If i had one million dollars, i'd stay up and watch it, all night! It's a fantastic stance to have...if you've never taken the other stance to begin with (and believe me, i wish to no end that the U.S. had always been this way)...unfortunately, when you've shown the world that you want to not only be the humanitarian core but also the world's police department, eventually they expect it...and after they grow comfortable in expecting it, they DEMAND it or they threaten various things (that really don't mean much in the long run anyways but look bad in the media spotlight). I think my marine buddy said it best...he told me one day when he was in Iraq (he was in tank battalion) and they were driving down some random road in some random part of that POS country...that some guy walking along the side of the road asked (in broken english) "If our country is crap whether you're here or not, why bother? ", to which my friend replied "Good question, if i could leave now, i would, and leave you guys to your own garbage." I tend to apply that to the entire world that "requests" (lmao) our presence in some way, shape or form. Pull 'em all back home and let us focus on us for once...we might actually have a country we're all proud of again to a legitimate extent. Last edited by SeanHRCC; 08-01-2011 at 10:03 AM. +1 Sean. Pull the troops out, and use them to secure our own borders. I do feel bad when i see pictures of starving kids in Somalia (I saw it before, in Vietnam), but who asked them to father those children? Why is it up to the U.S. to feed them? We have children in this country, who go to bed hungry every night. Illegal aliens should not be allowed to come into this country, have children and bill it to our government! It gets my Irish up just thinking about the situation, so i'll stop now. "Hello. Thank you for calling (insert random company name) for English press 1. For any other language, press 2 to be directed to rosetta stone to learn English and call back again. " Oh how I wish this was how it worked. In fact, I believe I will change my companies automated answering service right now. You all make great points. Hopefully the powers that be will one day again listen to the voices of the people that make the country what it is. No. No. Not the politicians. No argument here... except to say that a lot of the "relief" we send overseas never makes it to those truly in need. The corrupt regimes that run those countries skim it off the top, line their pockets and watch their people starve to death from their palace windows. This is America... we should NOT have to "press 1 for English". Ever. And there should not be an option for pressing 2. #knowhatimean? You know what the big problem is in the world, when it comes to countries that are extremely underdeveloped and at the mercy of terrible people or regimes? It's the fact that their people are too cowardly, lazy or stupid to actually stand up for themselves, have up risings, and ultimately, CIVIL WARS to create change...they see what the "free world" has and they want it without the work. They want to have a free country like the United States without going through the same development processes that our country has gone through in the past...our country is a new kid on the block in comparison with so many of these countries, but almost from the get go, groups of people stood against tyranny, dictatorship and those types of control in order to create what we have now. To speak on the language issue...When i get called out to the many many federal buildings around Atlanta when issues arise, occasionally i will come across a person who does not speak english AT ALL...and while i do know a little bit of spanish from my wife (she is cuban), when a person starts speaking spanish to me, i let them know quickly that a conversation with me is in english, period...and if they want a spanish convo, they can either wait for another officer who speaks spanish or go on about their business. This frustrates the ones that are trying to be a hard *** and knowingly refrain from speaking english...always makes me laugh because i'll say something really brash but with a smile on my face and their facial reaction lets me know immediately that they know EXACTLY what I'm saying. I've listened to a guy talk to another officer in broken english and spanish and try to get him to say he's free to go (but speaking quickly and getting an officer to just agree to hurry up a process or something), this absolutely SCREWED a buddy of mine who was citing a man for public indecency (he was showing off his ****** to people at an IRS building), the man was spanish, and spoke broken english and spanish to him, he said (in spanish) "If you say i can leave, I'm also not in trouble for anything, correct? "...and this was on video...the man was let go because of this, and not charged over this technicality. Come at me with anything but English, and my only response is "No english, no conversation." Works every time. Last edited by SeanHRCC; 08-01-2011 at 03:11 PM. Fausty82 and grunt0300 like this. Funny we've been having this conversation, and just yesterday i was reading about how our own government is filing a law suit against the state of Alabama for having their own immigration policy and enforcement...really? 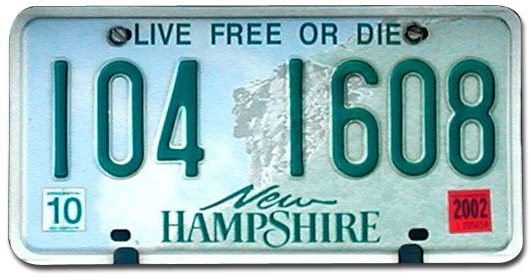 You want to punish a state for doing something our federal government hasn't been able to effectively do? There's something so much deeper to this that none of us see really, and I'm really anxious to know what it is...why would the feds sue a state for taking work load off of them, unless they don't want individual states to see something we shouldn't? unless they don't want individual states to see something we shouldn't? Exactly! The whole Fed gov't is just scetchy! I agree...and i work for them! The feds still have suits pending against Arizona as well. Ironically, when DHS Secretary Janet Napolitano was governor of Arizona she repeatedly stated that there was a major problem with a porous border and that securing the border and dealing with illegal immigration were federal issues. Now that she's DHS Secretary, she says the borders are secure. The feds either need to do their job of securing the borders and dealing with the flood of illegals pouring across the southern border, or get out of the way of the states who are willing to do something about it. 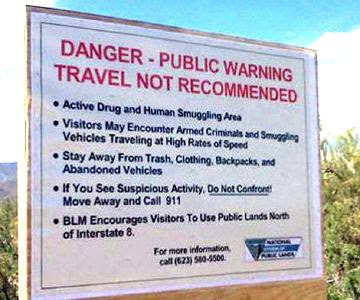 The saddest part is that the feds recognize that there is an issue and have even posted signs like the one below warning legal US Citizens to be careful and/or stay out of certain areas because of coyotes (human smugglers) and drug runners in the area. Last edited by Fausty82; 08-03-2011 at 11:24 AM.